Lets all have a glass of Champagne, or maybe a bottle. Did you know August 4th is Champagne Day? Just what we need at Aroma Thyme, an excuse to make a celebration. So that is just what we are doing. But one day is not enough. So we are doing our week long promotion from Sunday August 2nd to Thursday August 6th. 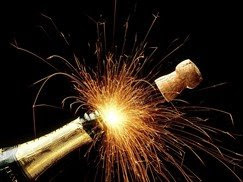 25% OFF* when you order any bottle of bubbly from our list. This includes Champagne, Cava, Prosecco, Moscato and so on. *offer not available on bottles over $100, thank you for understanding.